Getting the words right was not, in Conrad’s estimation, the whole task of the writer. 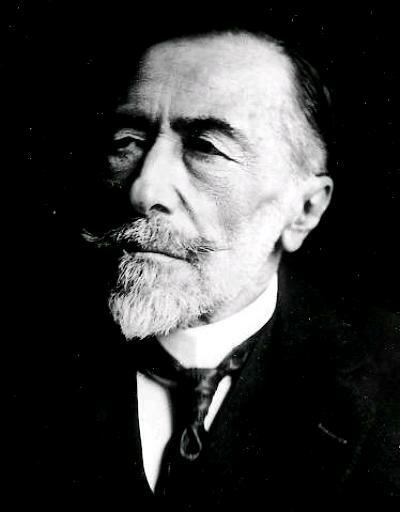 He was no artist for art’s own sake; his art was both to engage the reader’s attention and to make him see in more than the mere perceptual sense—to make him see “that glimpse of truth for which you have forgotten to ask.” Art, entertainment, and moral purpose were indivisible for Conrad. In finding something for his hand to do, and doing it with all his might, Conrad always kept morality in view. For Conrad, probity was perhaps the highest good, the moral quality he admired most; for him, very distant goals diluted probity and finally dissolved it utterly. The good that resulted from doing something with all one’s might had therefore to be tangible or immediate, and not so far removed that it entailed or permitted the doing of evil in the name of the eventual good that it would supposedly produce. The risks of distance are shown by the colonialists in “Heart of Darkness” and the revolutionaries in The Secret Agent (and other antirevolutionary books and stories). Kurtz has grand plans for a mission civilisatrice in the depths of the primeval forest that end with decapitated heads impaled on poles; while the principal achievement of the revolutionaries surrounding Verloc in The Secret Agent is the death in an explosion of a half-witted boy, much loved by his sister, revolutionary rhetoric having driven him to a willingness to commit a bomb outrage. Conrad seems to have been right about so much and yet denied himself the consolations that do, in fact, exist.